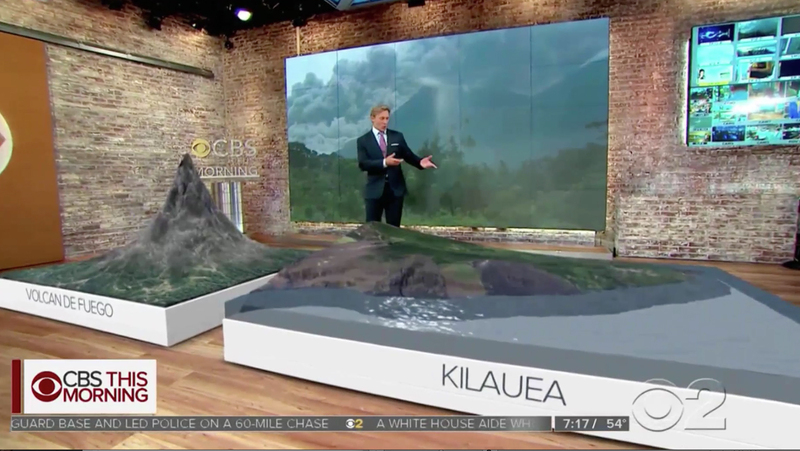 The broadcast brought in forecaster Lonnie Quinn from its flagship O&O in New York to explain the differences between the two volcanoes using 3D models of the landforms that, thanks to augmented reality, were “placed” on the floor of Studio 57. The models sat atop off-white bases which each one labeled clearly on the front, and various datapoints such as height and lava temperature popped up as Quinn mentioned each. Both models could also be split in half, with the front segments of each model zipping off screen and showing a cross section view of the inner workings of the volcanoes, including how their structures affect eruptions. 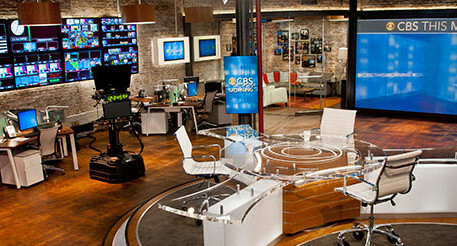 Quinn presented the segment from in front of one of the studio’s large video walls showing video footage of the eruptions, with the dimensional “CBS This Morning” logo on a small table in the corner and the space’s trademark faux brick walls in the background. The graphics were powered by Vizrt and created in Viz Virtual Studio.